Someday in the future hard drives will inevitably become obsolete. That day is not today—HDDs still represent the best bang-for-buck for bulk storage duties and if you happen to be running low, you can add 4TB to your setup for $105. Seagate's 4TB Barracuda drive is currently on sale for that price. That works out to less than 3 cents per gigabyte, which is far lower than even the least expensive solid state drives. Take note that the Barracuda is not Seagate's performance designation (that distinction belongs to the Barracuda Pro, or Firecuda if going the SSHD route). The Barracuda line is aimed at "versatile" storage chores, which is marketing speak for general purpose storage. That said, the 4TB model sports 64MB of cache and has a SATA 6Gbps interface. It is rated to deliver read and write speeds of 146MB/s on average, with a maximum sustained data rate of up to 180MB/s. 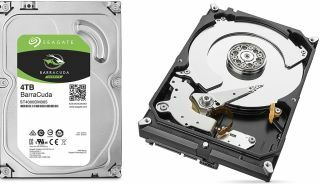 Both Amazon and Newegg have the Seagate 4TB Barracuda drive on sale, the latter of which says the discounted price is good through Wednesday. If it's faster bulk storage you're after, Seagate's Barracuda Pro line is on sale as well. Newegg has the best deal on the 6TB Barracuda Pro for $260, while Amazon is the cheaper route for both the 8TB ($330) and 10TB ($490) models. All three work out to between 4 and 5 cents per gigabyte.